It should be obvious from my imaginary booth number that I love Sherlock Holmes and his ilk. I should have been born English. On July 4th, I wish for Reunification Day as much as I celebrate Independence Day. All to say, I love the English language. I love how it sounds, when tailored well. I love words and I love storytelling. It may come as no surprise that I was an English major in college — though I very nearly wasn’t. My first, compulsory English class was miserable and I nearly scrapped the idea altogether. The next semester there was a class entitled “The Detective and Criminal in Literature.” We read Poe and Doyle, but I was also exposed to Wilkie Collins, whose vast works I am still enjoying. It was by no means a “fluff” course, but engaged my sensibilities on a different level. I am now finishing my Masters in Cinema Studies, which uses some of the same tools to examine storytelling. By day, I manage a nonprofit. But a little over a year ago I practically fell into book reviews. I strive to write reviews that do more than provide a summary. Rather, I attempt to use my skills as an analyst to tease out themes. Most of all, I try to make sure my reader knows whether or not THEY might like the book, regardless of how I liked it. I’d like to think Holmes and Watson would have approved. I’m blogging from my home in a Historic District near Savannah, GA. This is my first Armchair BEA, and I’m hoping to “meet” some great bloggers, authors and publicists! Hi! What a beautiful blog you have. I love the ephemera background design. I am also a big fan of Holmes and Watson and I'm currently reading THE WOMAN IN WHITE by Wilkie Collins. For whatever reason I've never read it before. Armchair BEA looks like it's going to be a lot of fun and a great way to meet fellow bloggers. Hi there. Jeremy Brett absolutely IS Sherlock Holmes. I watched them as a child and I still love them. He exudes Sherlock. You should read the first one, A Study in Scarlet, which is actually novel-length. 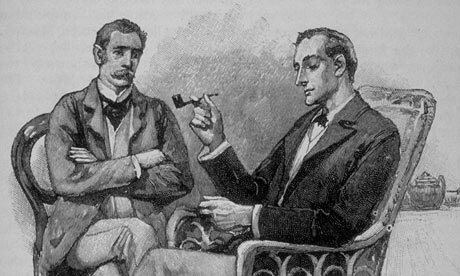 It takes a bit to get going but you get to see the meeting of Holmes and Watson. And it is an interesting look at Mormons from the point of view of Victorians in England. For stories, I like Boscombe Valley Mystery, The Solitary Cyclist, Copper Beeches and of course the Final Problem! It's so great that you are a fan of Sherlock Holmes. I haven't read any Holmes stories since years ago in school when I read The Hound of the Baskervilles. But I've become addicted to the th series in which actor Jeremy Brett portrays Sherlock Holmes (he's fantastic). I have been watching the series on Netflix for months and am anxious to read some of Sherlock Holmes stories. Do you recommend any in particular? I enjoy detective fiction and mysteries so I don't know why I haven't read about Holmes before. Oh well. Thanks for your help. Your blog looks great. I'll be back to visit again! I *love* the Woman in White. I can only imagine what it must have been like to have to wait for the next installment to come out in each issue of the magazine. It must have been maddening! Enjoying it so far, and it's only been a day and half! I love getting into a novel for a review, looking beyond the superficial and trying to ferret out the author's meaning/reason for writing/lesson/etc. It keeps me engaged as a reader as well as strengthens my comprehension. On behalf of the Armchair BEA organizers, we hope you have a blast this week! Actually, Savannah was spared from Sherman's destruction. We're pretty proud of a local who met Sherman on the outskirts of town carrying surrender papers, in exchange for Savannah's safety. Sherman sent a telegram to Lincoln, offering Savannah and 25,000 bales of cotton as a Christmas present. Because of that, we have tons of extant history. 22 of the 24 squares laid out by General Oglethorpe in 1733 are still here, for example. I'm not from Savannah originally, or even the South. On my first trip down here, I visited both Savannah and Charleston. While I enjoyed both, I kept coming back to Savannah, until I just stayed… and I love it. I even married into Savannah history – my husband is Johnny Mercer's nephew! I completely overlooked the "Savannah, GA" part. Hubby and I were just talking about how several people I know have mentioned that Savannah is on their wish list of places to go (they've mentioned it because I just returned from Charleston) and I wondered if it's as interesting as Charleston. I had it in my head that it might have been a victim of Sherman's march to the sea, for some reason. I'm pretty analytical, too. Sometimes that translates to very long reviews. I'm trying to be more succinct, but I don't always succeed. I've never heard of a masters in Cinema Studies. How fun! Hope you have a fabulous Armchair BEA week!